Hong Kong citizens claim that the city’s police are treating leniently those who are attacking Occupy Central protesters, helping organize those opposing Occupy Central, and, in one case, attempting to deceive the Occupy Central protesters into surrendering their site outside the chief executive’s office. On the afternoon of Oct. 3 hundreds of people opposing the pro-democracy movement Occupy Central showed up where protesters were concentrated in the neighborhoods of Mongkok and Causeway Bay. The interlopers started to push and beat protesters, broke down protesters’ tents and tore up Occupy Central banners. During the night, the attacks grew fiercer. 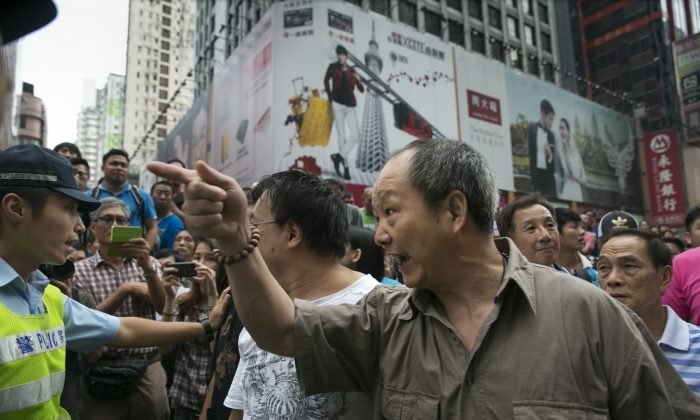 Photos and videos show male Occupy Central protesters with blood running down their faces. Several young female protesters also reported being attacked. The Hong Kong police did not deal harshly with the attackers. The Hong Kong newspaper Apple Daily published on its website video of Occupy Central protesters seeking police officers to help arrest the attackers, but police officers instead kept standing there and calling for everyone to calm down. Another video shows a police officer taking away an attacker and letting him go after walking a block away from the protesters. Even reporters have been attacked. In an Apple Daily video taken on Sunday afternoon in Mongkok, a man beat up a reporter who was filming him destroying Occupy Central banners. The middle aged man in a blue shirt yelled, “Don’t film me!” at the reporter, then struck the reporter’s camera, and punched at his face. The attacker was eventually taken away by a policeman putting his hands on the man’s shoulders, but no handcuffs were used, nor did the policeman appear to be stern with him. 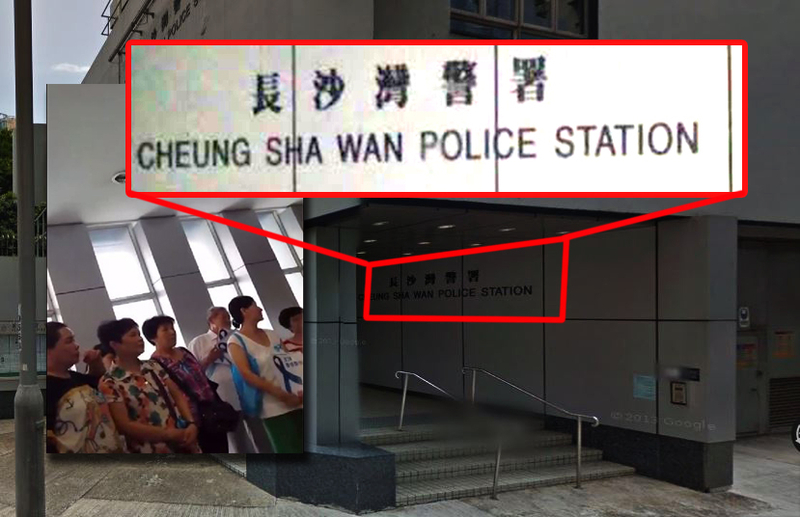 A video secretly filmed by an anonymous Hong Kong citizen shows a group of people receiving anti-Occupy Central materials at the Cheung Sha Wan Police Station on Oct. 3. The footage shows a group of middle aged and older people walking into the police station. Then, several staff in plain clothes and wearing i.d. cards around their necks came downstairs at the station and handed out papers printed with the large blue ribbon logo used by those opposing Occupy Central. The people receiving the papers then seemed to wait for further instructions. Some Occupy Central demonstrators blocking the entrance to the chief executive’s office announced on the afternoon of Oct. 5 that they would retreat. Hong Kong citizens using the Internet discovered the individual announcing the protesters would pull back was himself a police officer. That afternoon a young man who claimed to be an Occupy Central protester used a megaphone to call for protesters to retreat from outside of the chief executive office and communicate with the government peacefully, according to i-Cable News in Hong Kong. The man then shook hands with the police in front of the cameras of the Hong Kong media, and assisted the police to move a barricade away to show his cooperation. However, many protesters on site disagreed with his decision of retreating, saying that his decision can’t represent theirs. Hundreds surged forward and continued to occupy the entrance of the chief executive office. The Hong Kong chief executive Leung Chun-ying gave a statement on Saturday evening, urging the demonstrators to clear out of the main roads by Monday morning so that people can go to school and work. Whether the police will use violence to disperse protesters by Monday is unclear. Some Hong Kong protesters stated on the internet they witnessed police bringing in supplies on Oct. 2 to the chief executive’s office, including rubber bullets, tear gas, and pepper spray.